Another one up for climate change – analysis of tree ring data from Vietnam give us a better understanding of how climate change in the 14th and 15th centuries contributed to the collapse of Angkor in an open-access article published in the Proceedings of the National Academy of Sciences. 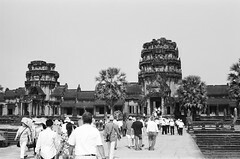 The â€œhydraulic cityâ€ of Angkor, the capitol of the Khmer Empire in Cambodia, experienced decades-long drought interspersed with intense monsoons in the fourteenth and fifteenth centuries that, in combination with other factors, contributed to its eventual demise. The climatic evidence comes from a seven-and-a-half century robust hydroclimate reconstruction from tropical southern Vietnamese tree rings. The Angkor droughts were of a duration and severity that would have impacted the sprawling cityâ€™s water supply and agricultural productivity, while high-magnitude monsoon years damaged its water control infrastructure. Hydroclimate variability for this region is strongly and inversely correlated with tropical Pacific sea surface temperature, indicating that a warm Pacific and El NiÃ±o events induce drought at interannual and interdecadal time scales, and that low-frequency variations of tropical Pacific climate can exert significant influence over Southeast Asian climate and society. Download the open-access article here.